In the spirit of July 4th weekend, I thought it would be fun to talk about a really good party snack -- popcorn. For most people dieting or trying to eat healthy, popcorn is a great snack, but usually not flavored popcorn. In fact, as a kid, I used to love eating candied popcorn, but as an adult trying to eat healthy and watch my weight, I didn't think I would ever be able to eat anything like it again. 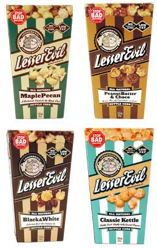 That was, until I spotted "Lesser Evil" (meaning it does not have "evil" ingredients like high fructose corn syrup, artificial stuff, or hydrogenated oils) popcorn in the chips and popcorn aisle at Whole Foods. To be honest, as I stood in the aisle excited beyond believe, I was nervous, since even though the brand looked consistent with the types of foods I try so hard to eat, I was scared to see the calorie and fat information (which often disappoints me, and leads me to pass on foods I'd otherwise love to try). Generally speaking, I look for snacks that (1) taste good, (2) have a big enough serving to be filling, and (3) are about 2 WW points. As I turned the box over, I saw that Lesser Evil was right on target for me, with only 120 calories & 2 WW points for all 4 flavors (although the peanut butter flavor serving is slightly smaller in volume -- see shopping tip below), per 30 gram serving. Yay! So, I bought one box of the "maple pecan" flavor and one box of "black and white" flavor. Since I was really excited, I opened them both right when I got home. I used my food scale to weigh out half a portion of each, and I put the combined popcorn in a bowl. I sat down at the table, and I realized that this popcorn was not only yummy, it was beyond delicious. Since then, it has always fulfilled my sugar cravings and my cravings for candied or flavored popcorn! I've since tried the "peanut butter and choco" flavor which is also amazing. I've yet to try the kettle (I can't get away from the other three flavors which I love), but would love it if someone could comment on whether it is good or not! I buy Lesser Evil popcorn at Whole Foods. There are also a couple of flavors (Black and White, Kettle) available at the Yummy Diet Food Amazon Store. Shopping Tip: When looking at nutritional information, always pay attention to both the weight *and* serving size, especially when comparing different flavors of the same type of food. In the case of Lesser Evil, there is one flavor that actually weighs more (the peanut butter flavor), and so the serving size is a bit smaller (3/4 cup vs. 1 cup). I've tried the kettle flavor. It is also delicious. this stuff is good. like REALLY good. they have these potato fries that are amazing as well. I definitely need to try the potato fries!